DEMO 2012 International will be one of the larger logging equipment show in North America this year and be held near one of the most historic and beautiful cities on the continent. The DEMO show is being held in Saint-Raymond, Quebec, just 75 kilometres from Québec City, from September 20-22, 2012. 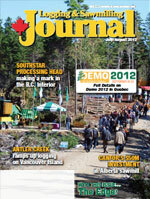 This issue of Logging and Sawmilling Journal contains the full meal deal on DEMO. John Murgatroyd and John Prachnau have quickly ramped up logging operations on Vancouver Island in the last few years, through their companies Coast Forest Industries and Antler Creek Logging, utilizing a variety of logging equipment along the way. A newly developed roll coupled hitch can deliver both cut-to-length logging truck safety and a payload dividend to log haulers. Canfor’s $50 million investment in its Grande Prairie, Alberta, sawmill—in its log yard, an energy system and in its planer mill—will help the mill focus on delivering high quality lumber at a low cost. The Southstar processing head—new to Canada—hasn’t been working long for B.C. logging contractor Randy Spence, but so far he’s sold on the performance of the New Zealand-developed, Canadian-serviced, heads. Included in The Edge, Canada’s leading publication on research in the forest industry, are stories from FP Innovations, the Canadian Wood Fibre Centre, The ForValueNet NSERC Strategic Network on Forest Management for Value-Added Products, Alberta Innovates Bio Solutions, and Alberta’s Agroforestry & Woodlot Extension Society. Logging and Sawmilling Journal has the latest product information on rubber-tired harvesters in this issue’s Tech Update. Jim Stirling says there are bound to be howls of protest when an all party legislative committee representing the B.C. 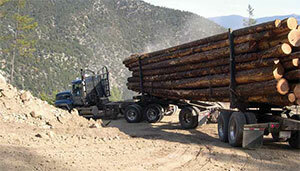 government comes in with its report on the province’s timber supply. In sawmills, the raw material comprises by far the greatest part of the operating cost, typically about 75 per cent of the total. Thus, the successful operation of a sawmill depends on its ability to achieve the highest possible value recovery from the raw material. To achieve this, it is important to be able to sort the log material to fit the intended use. Such sorting maximizes economic value by assigning all high quality material to high value products, while leaving only low quality material to low value products. This process reduces material waste, thereby reducing log consumption and environmental pressure on forest resources. X-ray scanning is a promising method for inspecting and sorting logs because it can observe the internal structure of the logs and identify the locations and sizes of quality controlling features such as knots, heartwood/sapwood extent, rot, holes, etc. However X-ray technology has not been widely applied in sawmills because the equipment is modelled on the design of medical X-ray equipment, which has higher spatial and density resolution capabilities than are needed for log sorting applications. The associated scanner cost and complexity are correspondingly high, rather too high for many sawmills. The emphasis in this project is to build and demonstrate a simple, low-cost and low resolution X-ray system that has the potential to meet the sawmill working requirements and can effectively identify the quality controlling features of logs to enable effective log sorting in sawmills. The approach in this project is to use a conventional X-ray source with a large X-ray detector array panel, shown above. The log to be inspected is advanced past the X-ray source and detector array. 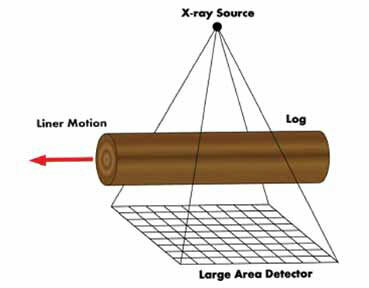 X-ray measurements are obtained and analyzed to reveal the internal structure of the log. The research work involves designing, fabricating and assembling the X-ray system, building a log translation device, and formulating mathematical models and algorithms to identify log quality controlling features from the X-ray measurements. The novel design dramatically reduces overall cost by using only one X-ray source and detector system. The detector system receives a much greater fraction of the available X-rays than does a conventional arrangement, thus allowing a much smaller, less costly and safer X-ray source. A prototype X-ray log scanner is under construction and a preliminary features identification algorithm is under development. Initial testing results are very promising: the interior structures of logs can be clearly seen and identified from the X-ray measurements. The results indicate that this low-cost log scanner has promise as a practical tool for sawmill use. Steep descents in the mountainous terrains of British Columbia present safety concerns for the forest industry. Road grades often exceed 20 per cent, with some short pitches reaching 28 per cent—levels that can seriously impact hauling safety. With funding from Natural Resources Canada and support from WorkSafeBC, FPInnovations has been working hard at making steep roads safer for the forest industry, offering a spreadsheet tool to help forest planners determine appropriate loads for hauling on steep grades and for descending a specific road condition. This tool has been developed into a software application designed to run on BlackBerry smartphones and Apple iPhones, and eventually, on other mobile devices. The easy accessibility of this mobile app on site will improve safety, and is expected to optimize payloads and improve hauling efficiency. In one coastal application, it was estimated that payload capacity could have been improved by 10 per cent, if the guidelines had been utilized. The safe descent of steep grades with a loaded logging truck is indeed a challenging task requiring considerable driver expertise and knowledge. But the risks associated with descending steep grades may be alleviated through diligent road design, following safe operating procedures and haul planning with the aid of tools such as FPInnovations’ cell phone application. It is no doubt a valuable tool for operations staff to complete mandated risk assessments for log hauling on steep grades. Tolerant hardwood stands stretch from Nova Scotia to Ontario in a band between the more southern hardwood forests and the northern boreal forests. These stands, dominated by sugar maple, yellow birch, and eastern hemlock, require partial cutting systems to emulate small disturbances such as an individual tree falling or a small opening in the canopy. The other unique property of tolerant hardwoods is logs can fetch extremely high values if the log is the right size, quality, and appearance. Veneer and high-end sawlogs often fetch prices 10 times or greater that of lower grade material, so it is important to emphasize quality over quantity in managing these stands. Past practices have left an abundance of lower grade stands desperately in need of improvement. Markets for poorer quality and smaller material allow these improvement cuts, but quite often at marginal economics. Tolerant hardwood management in Ontario moved from Diameter Limit (DL) cutting to the Single Tree Selection (STS) system in the period from about 1975 to 1985. A similar evolution occurred in Quebec with DL cutting being phased out by the mid 1990s. Both systems are partial cut systems with a return interval long enough to allow sufficient growth to accrue; usually around 20 years. Under DL cutting, when a tree reached the prescribed minimum size and quality, it was harvested regardless of its future potential, current market, or any other values such as wildlife habitat. Under STS, a more complex decision process is used to assess the future quality and potential of each stem, any wildlife or other significant features, and the tree placed spatially in context with its neighbours. A decision is then made to remove or retain the tree. Stands are managed to retain sufficient stems in various sizes: pole, small, medium, and large sawlogs with the goal of improving the future harvest whilst providing sufficient value in the current harvest to make the whole exercise economic. In theory, the system moves toward a steady state sustainable harvest at the stand level with continuous improvement. Ontario’s STS management implements the complimentary concept of managing for present and future value, but without a tool to quantify decision outcomes. 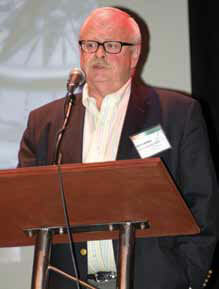 Jean-Martin Lussier of the Canadian Wood Fibre Centre has developed a Decision Support Tool to fill this gap: Biolley. Biolley includes a progression probability matrix based upon real permanent sample plot data that provides a prediction of where a given stem will be in the future in terms of the tree’s size, quality, and life expectancy. This data, combined with market prices and harvest costs, allows the model to judge the risk/reward of leaving or removing an individual stem while meeting stand based targets for basal area and other values. Biolley represents the next evolution of the STS system by quantifying the value choices being made; something that was part of the system but without a Decision Support Tool. Biolley seeks to increase the net revenues of periodic harvests in this partial cut system while moving towards the ideal steady state. But the real test of a model is how it performs in the real world. Implementation of STS is done through pre-harvest tree marking on the forest floor. Pre-marking the stand with certified tree markers is seen as the best way to protect the stand and landscape objectives when the harvesters implement the cut. In a brief test of the Biolley model in a real forest against the current Ontario Tree Marking guide, Biolley agreed with the existing system in the bulk of decisions but differed in two significant areas. One was the removal of small defective stems, which Biolley says to leave as they will most likely die anyway and are not worth the cost of harvesting. Standard practice is these small defective stems should be removed to free up resources for the remaining better quality stems or to eliminate infectious material. At the other end of the size spectrum, Biolley suggests sending more of the larger good quality stems to market (cut them now) rather than leave them to grow even larger. The model is using the market price and the risk/reward evaluation to guide this decision along with the prediction the middle size material will grow into this size category to meet the stand structural requirements. Further work is needed on the Biolley model to improve the handling of in-growth, to fine tune the size classes used (Biolley uses four size classes right now), and to gather better pricing data. Once refined, the model will be further tested in Ontario and elsewhere to see if it meets the goal of assisting decisions, being an aid useful on the forest floor, and improving the net revenues of periodic harvests while moving stands to an ideal steady state. When the last major Canadian boreal mixedwood conference was held in 1989, Canadian Wood Fibre Centre (CWFC) forest development researcher Dan MacIsaac says that hardwoods were gaining in economic importance—particularly across the Prairie Provinces. However, forest companies did not have much experience with mixedwood management. At that time, researchers conducted a review with federal, provincial and industrial forestry staff to identify what they viewed as their main boreal mixedwood forest management challenges. “The main message revealed by this review was that the co-existence of aspen and spruce on the same site represents a well adapted mix, but such ecosystems presented unique silvicultural problems,” says MacIsaac. 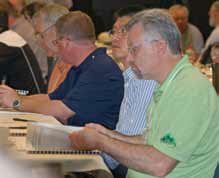 That’s why the recent Boreal Mixedwoods 2012 Conference in Edmonton was particularly timely. It was also well-attended, with over 110 participants. It brought together a diverse group of industry, academic, and government representatives to share and discuss the latest science and management applications related to boreal mixedwood management. The CWFC was a major conference supporter, and also co-hosted a two-day, post conference tour to various mixedwood and afforestation sites in northern Alberta. “Holding a conference like this is critical and will result in numerous journal papers,” says MacIsaac. He, along with Dr. Phil Comeau from the Department of Renewable Resources at the University of Alberta, headed the group that organized the Edmonton conference. “The amount of knowledge we have on mixedwood management has really increased exponentially,” MacIssac adds, “and a conference like this is a really good opportunity to spread the news of what’s happening.” Listening to the presentations, he noted a number of suggestions that industry representatives could take back to their companies and consider implementing almost immediately. Derek Sidders, CWFC Regional Coordinator for the Prairies, says the networking and knowledge transfer that occurs at a conference like this helps to fulfil a major part of the CWFC’s mandate. The issue of maintaining and increasing productivity of the boreal mixedwood forest on both a large and small scale was a common thread in many presentations related to stand dynamics, planning, growth and yield, ecology, silviculture, and climate change. It was addressed directly in presentations such as new developments in the mixedwood growth model for the western boreal forest, natural and inexpensive means of regenerating boreal mixedwood forests, effective practices to restore soil on previous industrial sites in boreal forests, and challenges in assessing drought impacts on boreal aspen and mixedwood stands in Western Canada. In a project called the Falling Snow Ecosystem Project near Thunder Bay, Ontario, which examined 20-year-old stands that ranged in composition from pure spruce to pure aspen, and others with varying degrees of mixture, researchers concluded that there was no evidence that production varied with species proportion within the sampled stands. Another research project from Lakehead University researchers tackled the issue of “Diversity-productivity relationships in forest ecosystems”, which addresses the persistent debate about diversity effects in natural versus planted systems. It concluded that looking at mixedwood stands in a variety of geographical areas throughout the world, vegetation polycultures were about 24 per cent more productive than monocultures. Researchers conducted an exhaustive review of over 40 research projects which studied this issue and found that a good balance of different species—including species with contrasting shade tolerance—and stand age were major contributors to site productivity. This finding may encourage forest companies to consider adjusting their mixedwood management practices to include more vegetation diversity to achieve greater site productivity. It may also represent a trend in boreal mixedwood management in the 21st century, according to Dr. Comeau. Talking about mixedwood management for the late 21st century and what the future might hold, Comeau said: “Global interest in ‘close to nature’ and ‘continuous cover’ approaches to forest management will continue to grow through the 21st century. There are opportunities to apply these in the boreal forest, and there are many advantages.” However, he noted that foresters need to have access to a wide range of tools and practices, many of which were summarized during the conference, to maintain the desired mix of stand types in the landscape. Comeau added that there will likely be a place for intensive as well as extensive management, and that foresters will continue to be challenged to find cost-effective ways to maintain mixedwoods. For more information about the Boreal Mixedwood 2012 Conference, contact Derek Sidders at (780) 435-7355 or dsidders@nrcan.gc.ca, or Dr. Phil Comeau at (780) 492-1879 or phil.comeau@ales.ualberta.ca. Copies of many of the presentations are available on the conference website at http://www.ualberta.ca/~pcomeau/mixedwoods2012/Borealmixedwoods2012.html. The province of Alberta has a large hardwood and softwood resource growing on private woodlots. A portion of that wood is harvested and sold annually, primarily to the forest industry. The role of the Agroforestry & Woodlot Extension Society (AWES) is to help woodlot owners manage their woodlots for multiple values and with sustainability in mind. Private forestland represents about 3.6 million hectares in Alberta, or an area about three times the size of Prince Edward Island. The mission of the AWES is to increase awareness of the economic, social and environmental values of woodlots and agroforestry in the agricultural landscape. It promotes responsible woodlot and agroforestry management by providing support and extension services to landowners, land stewards and others who influence land use practices in Alberta. “Woodlots have economic, environmental and social value,” says Nolan Duguid, AWES agroforestry technician. He adds that formation of the society has been a decade in the making, and resulted from a concern among private landowners, industry, and government about the need for private woodlot management vs. forest liquidation. With more and more private woodlots being harvested, these various stakeholders realized that there was a need for extension services to provide landowners with information about the value of their woodlots and how to manage them for multiple benefits. The amount of wood being harvested from private woodlots at present is understandably significantly lower in 2011 than it was a decade ago, reflecting reduced demand for wood products generally as a result of the economic downturn. In 2009, the coniferous harvest was 14 per cent of the 2004 coniferous timber harvest, while the 2009 deciduous harvest was 21 percent of the 2005 harvest. In 2009, 0.5 percent of Alberta’s total softwood timber came from private forestland, while 13 percent of the total hardwood volume was from private forestland. However, before the AWES can provide the type of extension services needed by the province’s woodlot owners, it needed to understand why they purchased them in the first place and what landowners view as the most important values provided by their woodlots. It also needed to know how much wood was being purchased from private woodlots by the forest industry. According to a recent report prepared for AWES entitled, “Profile of the Private Forestland Sector in Alberta,” it turns out that AWES and private woodlots owners are already on the same page on the major issue of concern for maintaining a healthy and sustainable forest resource. “One of the greatest concerns facing woodlot owners is the health of their forests,” says the report. “Profit generation is not a top reason for owning a woodlot.” The top reasons for owning a woodlot involve non-consumptive amenity uses including: beauty and scenery, biodiversity, watershed protection, conservation and privacy. Within the operating principles for the AWES, it states that “we genuinely care about the future of Alberta’s privately-owned forests”. Duguid says the report will help AWES tailor its extension services program, given the priorities of Alberta woodlot owners. “The Profile of the Private Forestland Sector in Alberta report provides good baseline information for us,” says Toso Bozic, Woodlot/Agroforestry Specialist with Alberta Agriculture and Rural Development. 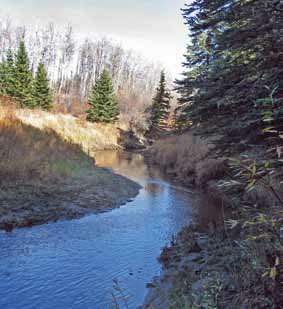 The current AWES program provides awareness to landowners and the public about woodlots and agroforestry; technical information on woodlots; assistance in the development of woodlot management plans; contact between government, conservation associations and forest companies; resource information; demonstration sites and tours; and workshops and seminars. AWES members include Alberta Agriculture and Rural Development, the Agri-Environment Services Branch, Alberta-Pacific Forest Industries, Alberta Sustainable Resource Development, the Webberville Community Forest Association, Daishowa-Marubeni International, the County of Grande Prairie, the County of Red Deer, Capital Power Corporation, the Land Stewardship Centre of Canada, Vanderwell Contractors (1971), and the Woodlot Association of Alberta. For more information about AWES and its extension program, contact Nolan Duguid at info@awes-ab.ca or Toso Bozic at toso.bozic@gov.ab.ca. The website address for AWES is www.awes-ab.ca. In the 1970s, Alberta introduced the zero-tillage approach to farm production, which led to much more efficient and productive farming practices on a global scale. Representatives of the province’s heritage forestry and agriculture industries continue to challenge organizations like Alberta Innovates Bio Solutions (AI Bio) to pursue innovation like this to help industry maintain a competitive advantage. AI Bio Chairman Art Froehlich. That was the opening message from AI Bio Chairman Art Froehlich at Impact Innovation 2012, AI Bio’s annual public outreach speaker series held in May in Edmonton and Calgary. “When we go back to our farming operations 30 years ago, we are now producing almost triple our production at half the cost in terms of energy use,” Froehlich added, showing how advances in equipment, technology like GPS, and management practices can improve competitiveness. The event was hosted by Jay Ingram, former TV host for the program Daily Planet on the Discovery Channel, who obtained his undergraduate degree in microbiology from the University of Alberta. He marveled at how much change has occurred as a result of the application of scientific knowledge over the past 30 years. Alberta’s new Enterprise and Advanced Education Minister Stephen Khan was among those who attended the Edmonton session. In his remarks, he urged AI Bio “to continue to boldly go where innovation and research hasn’t gone before”. The series featured presentations from a number of speakers engaged in research supported by AI Bio, such as the ongoing development of a searchable biomass database for the province, advanced science to gain a better understanding of the genetic nature of the mountain pine beetle to help predict its behavior as it treks east through Alberta’s boreal forest, and efforts to seamlessly integrate bioproducts potentially from wood fibre and agricultural commodities into and in partnership with the conventional oil and gas sector. By applying the science of genomics, Dr. Janice Cooke said that scientists are able to investigate 25,000 gene activities at a time in pine trees to understand how trees defend themselves against mountain pine beetle and the pathogenic fungi that the beetles carry with them. “What used to take years, we can now accomplish in a week,” she told the outreach seminar audience. This research has helped the Alberta government determine the leading edge of the beetle outbreak, so that it can take remedial action to halt or slow the destructive insect’s march east. In addition to providing more information about the beetle, genomics has also been used to identify pure lodgepole pine stands from lodgepole-jack pine hybrid stands and pure jack pine stands. “We were able to use that information to redraw the hybrid zone,” said Cooke. It also has helped scientists to state definitively that the beetle had migrated into pure jack pine stands. Dr. David Bressler, Executive Director of the AI Bio-supported Biorefining Conversions Network (BCN), said there is no doubt as to the importance of hydrocarbons to the Alberta economy. However, he also noted that the world is engaged in a global green revolution, which has created the potential for the expansion and inclusion of bio-energy and bio-products as part of the dialogue related to the future of the oil and gas industry. He stressed the importance of networking between those producing or with the potential to produce bio-products with the conventional oil and gas industry. “I don’t believe we are in silos any more,” he said, “but we have inherited these traditional languages.” The future success of greater inclusion of items and technology linked to the green economy with the traditional petroleum sector depends on effective communication. Bressler added that there is great interest within the oil and gas sector to engage in that conversation with industries like forestry and agriculture. Green Analytics, along with Silvacom, have partnered with AI Bio to create the Bio-Resource Information Management System, a database that will provide a current state profile of biomass availability in Alberta. The project will also identify gaps, where gathering of more information will be required to make the system as accurate and up-to-date as possible. Knowledge concerning biomass availability is a critical first step for attracting investment in the local bio-economy. “We don’t have the data that we need to guide our decision making process,” Mike Kennedy, Green Analytics president and chief executive officer, told the seminar audience, emphasizing the importance of having this type of information to grow the bio-economy. Describing their work so far, he said, “we knew there were gaps, but how much was missing was quite surprising”. AI Bio Chairman Froehlich concluded that the research work supported by AI Bio on its own or in partnership with its sister organizations will play a significant role in providing the Alberta forestry and agriculture sectors with competitive advantages to potentially provide new bio-based energy, chemical and consumer product solutions to help address challenges created by what is expected to be unprecedented demand for energy, water and food.